Gender stereotypes are so hell bent on pressurizing the males that a good height has now become a major factor of ‘masculinity’. Males try to appear as they are supposed to be; tall, just like women compete to look ‘beautiful’ as they are needed to be. In order to gain some inches, men use various height increasing tips and tricks while the catch here is, if you are an adult most of those tricks won’t work out as expected because of the physiological maturity attained by the body. Height Increasing Shoes for men in this scenario prove to be an oasis in the desert for short/average men who aspire to be tall. It is a reliable and promising technique to gain some more height with some dos and don’ts to be kept in mind. Go for a light-weight pair- Common shoes have evolved to such an extent that they are now almost weightless to increase the user comfortability and convenience. The chances of you stepping in one of those before taking your hands on height increasing shoes are beyond 80%. So as to maintain that evenness even when starting to use new shoes, it is recommended you to go for a lightweight model that feels easy to walk in and step forward without that heavy, chunky feel you may experience otherwise. Choose one with soft insole- This is something that doesn’t come up in mind when buying these shoes, but only when we use and walk in them. Soft insole ensures your feet to be in a healthy condition even after using them for many times. With hard insoles, you risk your feet to develop irritation, discomfort and nodes in them. Choose Quality Brand- A well setup brand offers its customers with the quality of its products which is often a miss out in cheap local brands. 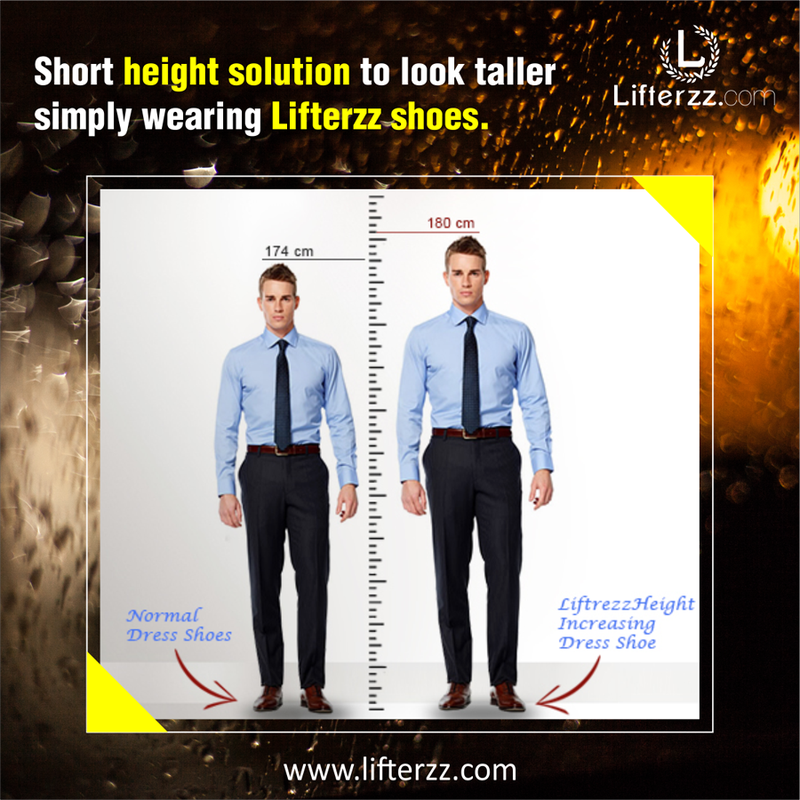 Elevator shoes can have positive consequence as by giving you a gain in height or negative consequence as in discomfort and uneasiness if not chosen the right one carefully. Always prioritize quality over money for your health because that’s ultimately the only thing you can’t and shouldn’t compromise. Start with a little rise- A sudden elevation of 4-5 inches can make you feel like wearing heels at the same time risk you of falling or getting stuckin odd places. Begin with 2.5-3.0 inches of rising and once you are adapted to the change which comes with the awkward walking feel, you can further add up some more inches. ü Lace up tight- Always try to fasten the laces tightly to get rid of foot bending or a dragging shoe kind of feel. In normal shoes, you can avoid this tip but with the elevator shoes wherein your feet raises to a few inches above the ground, you need to step forward only on the insole. Even a slight looseness between your feet and the shoe can be the cause of sprain and strain in your feet. Don’t assume these shoes to be the permanent height increase solution- It is anyways obvious, but for those who are not aware let me get your facts straight. Elevator shoes can give you a rise for a particular time when you are wearing these shoes like in theoffice, on a date, at a marriage, on a hangout with friends etc. Rest of the time you will have to live with the actual natural height of yours. So don’t confuse these shoes with the permanent solution. If it was the point that was in your thoughts while making a choice of these shoes, I will advise you to think it back. Refrain from running or gymming at the start- Initially you should hold yourself back from activities which can misalign your feet with respect to the shoe and cause foot injury or discomfort atleast for a few days until you get a good hold of them. After that also, you should be vigilant while indulging in activities like running, jumping, gymming and carrying heavy weight. Don’t wear loose fittings - Height gain shoes are actually composed of wedge insoles which are slopy and tend to pull your feet down forward. Loose fitting shoes can cause excessive strain on the front portion of your feet, i.e. in the extremities. This can result in swelling or blood clot later on in the process. So don’t wear loose shoes and only buy shoes that can hold your feet properly in a place when fastened with laces. Don’t buy incompatible insoles separately- Insoles are also sold separately to cheaply get a height rise or to replace when the built-in height rise insoles are worn off completely. Buying incompatible insoles either too big or too small can create issues with your gait and discomfort while walking. Replace the insoles with the same size as that of thelast one and in thecase of installing insoles to common shoes, I would rather suggest not to do it. Common shoes don’t have that depth inside to place height insoles which only elevator shoes provide. Don’t go beyond 3-inch height increase- Starting with a >3-inch increase can confuse your brain to make it react unevenly at odd places. You can either stuck or fall abruptly on the ground. It is not advised generally to go beyond 3-inch rise but if you anyways want to try more rise, adapt yourself with some low height lifts first. That’s a discreet and favorable choice you should make. Well friends, utilize these dos and don’ts next time you decide to put on elevator shoes. We often ignore small things in life which impact later on in a big way. Why go that way when we can use some tips to improve our overall experience and comfortability. On a personal note- I too have started using these shoes,ofcourseof the comfortable model that my feet chose for me. Fashion is not everything in life and can never be prioritized over health. Health is obviously the ultimate wealth. So choose wisely, live well. Good luck and stay tuned for more!